Students - This wee verse grew from the time of year. 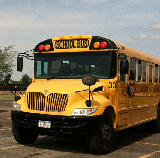 In classrooms all around the United States, schools are getting ready to let out for summer. Beginnings and endings are full of feelings, and this poem simply lists a few of them. Change is powerful and sometimes scary, beautiful and sometimes confusing. Life is like that. The word "bittersweet" is one of my favorite words because it so perfectly matches a feeling I often feel. This verse belongs to a family of such poems here at The Poem Farm. You can find the other two family members here: Ready (for the first day of school) and Last Day of School (for the last day). Today's poem is dedicated to Sheila Cocilova's second grade poets in Fairport, NY. It is also dedicated to all teachers and students at this looking-back-looking-forward time of year. Enjoy your memories and your celebrating of important milestones. Congratulations on your work, your friendships, what you have given to others, and all of the ways you have grown into being who you are meant to be. Happy joyous summer! Welcome to teacher Cheryl Donnelly and her fourth-grade students and Intermediate Literacy Coordinator Kristie Miner from the Whitney Point Central School District. Below, Kristie and Cheryl explain the process they followed in helping their students create theme-based poetry anthologies. Throughout the month of April, we followed Amy at The Poem Farm, enthusiastically reading her theme-based poems, learning from her daily writing tips. After the first week, students began to entertain the idea of writing poems based on their own themes, and from this, our theme-based poetry anthologies grew. Here you can see our anthology covers and read the students' poems and process notes. • First, students created lists of possible anthology themes in their writers’ notebooks. Topics included special places, memorable events, hobbies, favorite sports and even favorite foods. • Next, students selected a theme and generated a list of topics that could be included within their theme. • Students spent several days exploring published poetry, which then served as mentors for their own writing. • Students were guided by Amy’s daily “instruction” as they crafted new poems or revised poems-in-progress. • Finally, students published one poem from their growing collection. The biggest joy in creating our anthologies was watching the creativity flow out of every student. There were no parameters, and students responded with out-of-the-box thinking that resulted in unique, expressive and meaningful poetry. Most importantly, we learned that poetry resides within and around each of us—we just need to listen carefully to what it has to say. Much gratitude to these teachers and students for sharing this fantastic project. Way to take on a challenge! Over at Sharing Our Notebooks, I am happy to host Shane Couch with his many cool notebooks full of writing and art. Stop on over to learn about his notebooks and if you wish, comment to be entered in a notebook giveaway. Carol (she and Catherine switched weeks) is hosting today's Poetry Friday extravaganza over at Carol's Corner! Everyone is invited to read, eat, drink, share, and swim in poems and poem-celebrations of all kinds. Every Friday we pass the roundup around, and we welcome all. For those of you who are indeed finishing up school this week, please know that I will still be here throughout the summer, each Friday, versing away. What a wonderful way in which to end the school year. Loved your poem, Amy (9 days to go for us!) and the anthologies were such fun to peek into. Creativity was certainly flowing! Amy, once again I enjoyed your post, poem, and information on the work you have been doing. I posted my poem for Poetry Friday late so I am waiting for Carol to upload my comment and the link. Amy, your poem captures perfectly the nostalgic happy/sad feeling of this time of year. Love it! I wrote an end-of-year poem too Amy, & you're so right, it is a bittersweet time. I love seeing the anthologies. The students must treasure these collections they're completed. Thank you! We all have favorite memories of a last day of school. Thanks for triggering them. I enjoyed hearing about the students' project. You inspire great things. Keep visiting those classrooms. You really capture the complicated mix of emotions. I know someone to share this with. 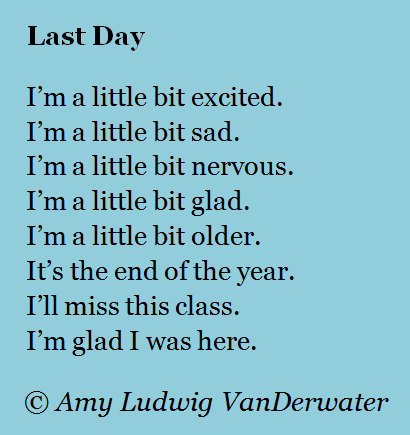 Thank you, thank you, thank you for this terrific end of school year poem, that perfectly captures the mixed emotions so many of us feel on this day. Our last day was Thursday, but I am saving your poem and will definitely share it with teachers next year! And I love, love, love the themed student anthologies. I have done lots of student poetry anthologies but have never done themed ones. Another project for next year! Very nice and such a lovely concept, thank you for sharing the students' project - very inspiring indeed. Ah, love the poem, and love that project! Love the poem. It is a happy/sad time of the year. We went through the last day of Little League with my grandson today. There were a lot of tears. Thanks for sharing.